Deb's Cup of Tea: Yup, that's long. It's been awhile since I've posted a hair photo. Jessie and I went to dinner on Thursday and I had her take my picture. That's how long the hair currently is. 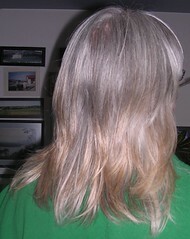 At the ends, there is still the remnants of the last dye job done in February 2009. I have received compliments on the length and the look and the color. "It fits you," I've been told. Thank you all, but I don't care for it long. It takes too much time to wash and dry and I have to pull it back to keep it out of my face when I drive with the top off or windows down. Yet, I don't have $40+ for a hair cut. Plus, I'm not sure what style I want if I did get it cut. It seems, unless I'm willing to pay $80 or so, when I walk into a salon, the first thing out of the stylist's mouth is, "So, how do you want this cut?" I suppose that's how they are trained, to never presuppose a client doesn't know. Still, I would love to find an inexpensive salon where I can say, "You know, I don't know how I want it cut. Do you have a suggestion?" and the stylist would say, "Oh sure, I saw this cut. Tell me what you think." He or she would have a magazine of styles and would suggest something. Plus, it wouldn't cost me upwards of $100 for the cut. I used to have a stylist like that but she left the business when she became pregnant. I cut my bangs but the rest, no. It's not been this long in 13 years and will stay this long until I get the resources to change it. As long hair is a very, very minor irritation in life, that's going to be awhile.